Okay, we need you to be honest with us. Well, since you're just reading our website you don't have to even answer out loud much less be honest but if you're dishonest you're cheating no one but yourself, so consider that. Okay, so, here's the question: do you feel yourself getting choked up when they sing the national anthem at games? If so, you aren't alone. The combination of the lights, the crowds listening with hands on hearts, and the bright lights brings out the patriot in all of us. Whether your inner patriot is a "Wahooing, Yeehawing" type or more of the free speech loving, beard growing sort you should really let him out every once in a while. Otherwise, like anything left in the attic for too long, your cheery patriotic energy might get a little musty and moth-eaten. Patriotism doesn't even have to be boring: buy a couple extra tootsie rolls from that veteran fund. Take a moment to consider the beauty of a flag waving in the afternoon sun. The most cheerful way to celebrate your country proud inner spirit? Wear those stars and stripes with pride! Too often the stars and stripes end up on a less than dignified piece of clothing like socks and boxer shorts. When it comes to this suit, you can be the change you wish to see. 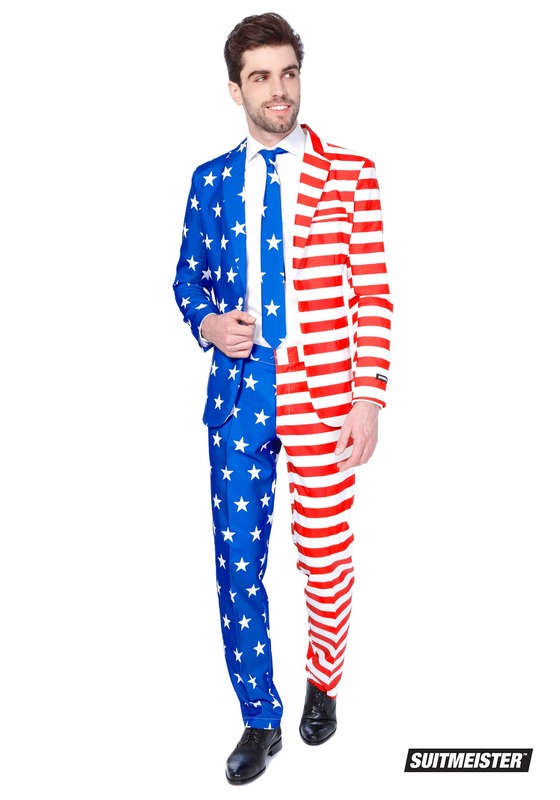 This American flag suit is perfect whether you're marching for equal rights or running for city council. Whatever you decide to do while wearing this suit, you'll enjoy letting the little patriot in your heart pull the strings for once. 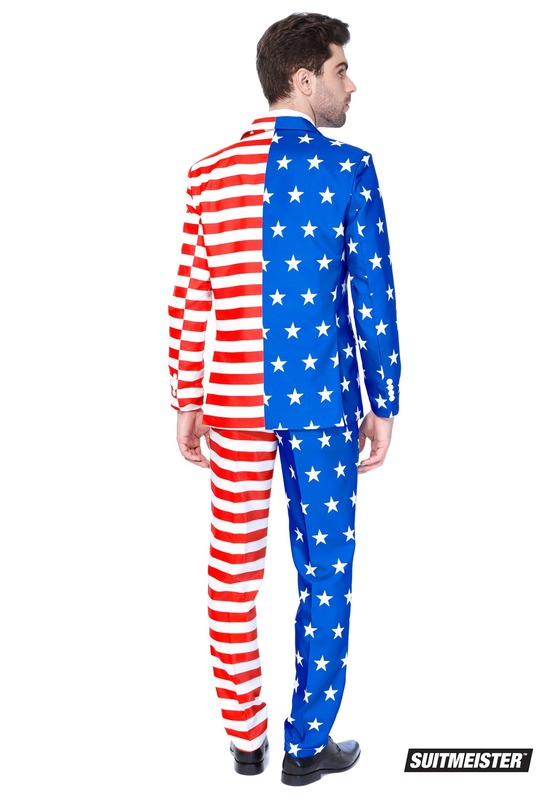 Who knows what will happen when you're wearing a suit made of stars and stripes. Maybe you'll end up doing something ridiculously patriotic, like feeding a bald eagle some apple pie in a baseball stadium, it's a free country you know.